Submission and strength go hand in hand. A few weeks ago I promised to follow up my two posts on biblical headship for husbands by giving wives equal time. (If you missed them, the posts are here: "Good and Strong" and "That's Not Headship"). Most of you have probably at least heard that there is something about wives and submission in the Bible. Some of you may even know the verses by heart. Wives, in the same way be submissive to your husbands so that, if any of them do not believe the word, they may be won over without words by the behavior of their wives, when they see the purity and reverence of your lives. You can choose to ignore these verses or pass them off as out of date for our modern world. But my belief is that if it's in the Bible, especially if it's in the New Testament, it's probably something God cares about today and something we should try to understand. Most of the women (and men) that have a problem with submission have a wrong understanding of what it actually is and what it isn't. That's what this post and my next post are about. understanding true biblical submission. Feminism - women don't need men in the first place and calling a wife to submission is like calling her to a life of slavery. Culture at large - 50/50 is the best way to run a marriage. Equality is the goal. Submission is unfair. Wrong paradigms - Captain/first mate, pilot/co-pilot, CEO/VP, etc. None of these sources are biblical. None of them work as a model for marriage. The one we should focus on is the only one in the Bible: marriage is to be a reflection Christ and the church. Specifically, you are to submit yourself to your husband as you do the the Lord. (No husbands are not gods or equal to Christ. 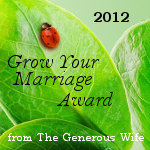 It means you should glean lessons for your marriage from way in which you submit to Christ). As I pointed out in my earlier posts for husbands, we often wrongly assume that goodness (being loving) and strength are mutually exclusive.But the corresponding call for husbands to love and lead their wives as Christ does for the church means that they should be both strong and good, just like Jesus is. In a similar fashion, you may mistakenly think that, as a wife, you cannot be both strong and submissive. So too for you, submission and strength are both important dimensions of your role as a wife. They are not mutually exclusive. 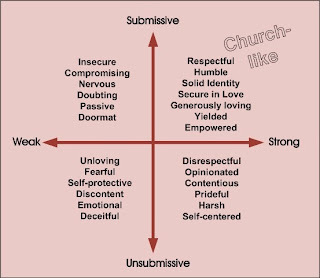 The upper right quadrant, the one labeled "church-like," is what I think the Bible calls you to as a wife: to be both strong and submissive. Forget the notion that submission means you are are to be a slave or a doormat or a Stepford automaton. No, the church-like imperative means you are to be empowered by your husband, secure and confident in his love, with a sure sense of God-given identity and purpose. But your strength does not conflict at all with the call for you to honor your husband with your respect, to follow and support him in humility, or to be selfless in giving your husband your love and devotion. The truth is that true biblical submission requires real strength. It requires you to have the mental strength to do battle with the lies you hear all around you about the 50/50 marriage paradigm, about needing to look out for yourself and to stand up for your rights. It requires the emotional strength to face your doubts and fears. And it requires strength of will to let go of your need to control, to follow God's design for your marriage and to follow your husband's lead. 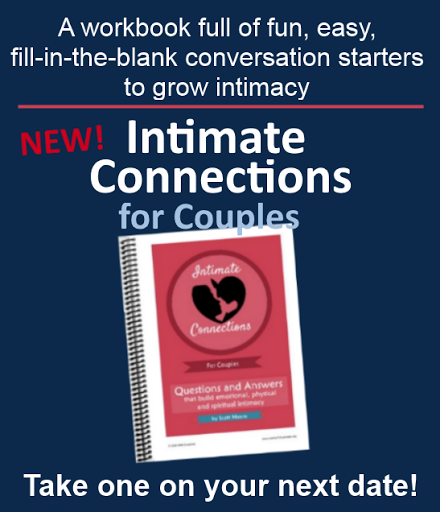 Yes, you can and should be both strong and submissive in your marriage. Don't let anyone try to convince you otherwise. Your submission actually makes you powerful. True submission is a gift you give to your husband, because when submission is demanded or coerced it isn't submission at all. The choice is wholly yours. Where do you tend to struggle the most in your marriage, with submission or with being strong? 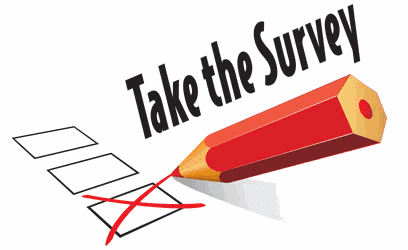 Share your story, leave a comment. Next time we'll take a look at what happens if you falter in either the strength or submission dimension of your role as a wife. Until then, you might want to check out what some other wives have to say about what submission means to them. 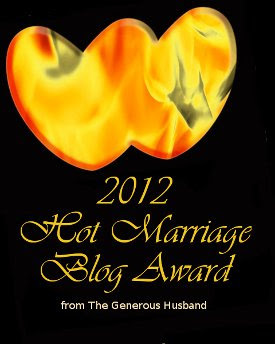 The Submission Series - a thoughtful and thorough ten part series from Lori at The Generous Wife. Well done. Good post on this topic. Thank you for so much clarity about the vital connection between strength and submission! Submitting in the Biblical context definitely isn't weakness. Your quadrant diagram separates out the factors so well. Thanks J and Ruth. It's hard to be concise and clear on such a complex and controversial topic. Obviously a single post can't cover all the caveats and what-ifs. I find the "submission is strength" argument rather hard to accept. It seems to be a bit of "making a silk purse out of a sow's ear." The kind of submission in marriage that you are talking about assumes a certain level of inferiority of women; I can't see any way around that. If women are never qualified to "lead," by definition there has to be something lacking in them. This helped me realize something. I like having a lot of irons in the fire and meats on the spit. Consequently, I often overwhelm myself, lose focus, get bored with a few of them and rarely finish. Being married and having to submit to my husband and my role as wife and homeschooling mom, I started to feel stifled by the limitations my role presents. I started resenting my husband for not giving me the freedom to do all I want to. I even started day dreaming about if I was single, I could do this, this and this and do it my way on my time. While there is nothing wrong with having interests, hobbies and pursuits or desiring them, I was crossing over into blatent selfishness. I have tremendous freedom in my marriage....so long as it fits our budget and family time....but that's normal life. When I read women are empowered by their husbands, at first I felt stifled and then I thought, "perhaps the limitations I am expected to submit to are there to rein me in and focus on what I can handle and focus on my ministry....being wife and mom to the glory of God. Hubby is empowering me! When I get to heaven, will God care that I dabbled in all of my interests, or that I did His calling for me? God won't forsake my need for developing myself or being myself. But, I do have a job to do on this earth!" GC - thanks for your comment and for taking the time to share your thoughts. Concerning your comment "The kind of submission in marriage that you are talking about assumes a certain level of inferiority of women" - The roles described in the Bible have nothing to do with inferiority or superiority. By your logic, you would have to also say that every boss is superior to every employee. Just isn't so. It's not a value judgment. That's the mistaken conclusion most egalitarians make. I read the Wade Burleson link you shared. I agree with much of what he says, though I think the way he parses the Greek of Eph 5 is a little bit of a stretch. He leaves unaddressed some key verses. I obviously disagree with his conclusions on whether or not the passage means that God grants a husband authority in his marriage. Yes husbands and wives are to serve and support one another, but that doesn't mean they have the same role. Kate - Thanks for sharing your journey. I don't know that I am comfortable describing a husband's role as "reigning his wife in" or "to put limits on" her. I do think the most important thing a husband is to do is to see that his wife fulfills her destiny in God, whatever that is. He is also to help her experience freedom in her life, not constrain or control her. He should understand and help lead her to have the desires of her heart fulfilled. KUDOS to you, this was sooo well written!! I have found in our marriage that the more I understand submission and live and move in it, the more powerful I become. Viewed through earthly eyes I think we call that a conundrum. But seen through eternal eyes it makes sense as God's kingdom is rather upside down. Robyn - Yes indeed, so many Kingdom principles are upside down from the world. Every time I read where Jesus says, "the Kingdom of Heaven is like..." you know he's about to rock your world!